Jamie Oliver's recipe done by Ms Rabel. 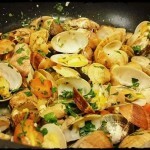 Just fry garlic in a good glug of olive oil, add clams and chilli. Fry for 45 seconds then add tomatoes then white wine and simmer for 1 minute with the lid on. Turn off heat then add parsley and butter!